Are you curious about the Universe? Do you want to explore the heavens? Have you ever been a star gazer? The members of the Ogden Astronomical Society extend an invitation to you to join our local astronomy club. You don’t need a telescope to be a member. We meet monthly at the Ott Planetarium at Weber State University on the second Thursday of each month (except June, July & August) at 7:30pm (1551 Edvalson St, Ogden, Utah). We have guest speakers, watch space related movies and have show and tell sessions. We also get together for fun activities. We go on several camping trips each year where we take our telescopes to some of the darkest places in the US. We get together for special events like eclipses, occultations and transits. 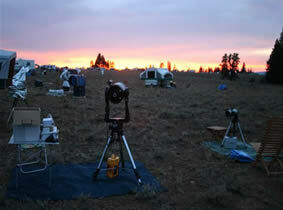 We also host Star Parties for the public, schools and other organizations.